Happy Monday lovelies! I hope you all had a wonderful weekend, and are having a great start to the new week! This weekend my boyfriend and I went to the pumpkin patch to get our pumpkins for the season, and we are hoping to finally get around to carving/painting them sometime this week. I am one of those people that prefers to paint a pumpkin over carving, unless someone does the carving work for me. My pumpkin carving skills are weak and I can only ever seem to get halfway done with a pumpkin until I hand it over to someone else. Maybe it's time to pick up my weights collecting dust in the corner - oops. Anyways, I wanted to share with you all my favorite everyday tote bag from Barrington Gifts because, to be honest, I am completely obsessed. The bag is high quality and very well made, and the inside is so roomy I can fit all of my necessities, and then some, inside! Being a blogger, I carry my laptop, agenda and camera with me everywhere, and this tote bag manages to hold all of those things with plenty of room to spare! I use this bag everyday because it is efficient and cute, but this bag would also be the perfect carryon for a flight, or for a weekend away at the cabin. 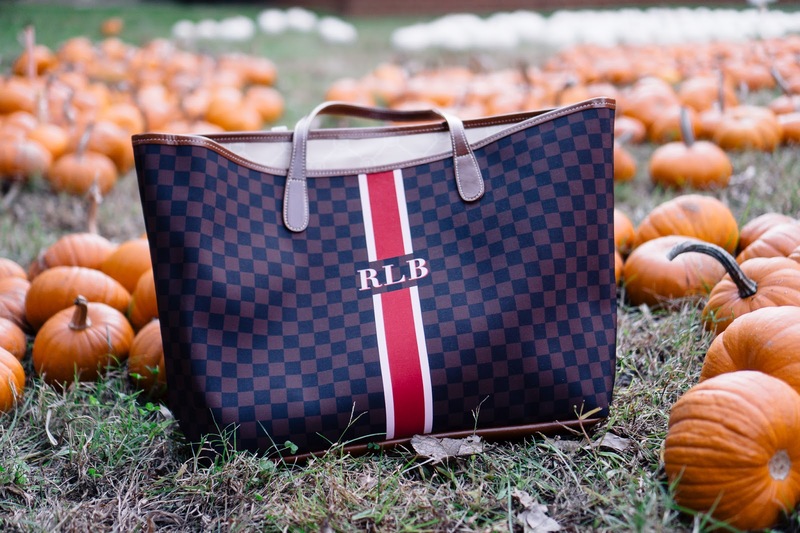 My bag is The St. Anne Tote - Fall Monogram with my favorite brown check pattern, which I find to be extremely versatile during the fall and winter seasons, but they also have a variety of patterns and colors to choose from to fit your style. You also get to choose the colors of your initials, and if you want a bag without initials that is also an option! Needless to say, I love these bags from Barrington Gifts and I am a fan of the brand! As for the rest of my outfit, I am wearing a rust colored asymmetrical sweater with a mock-neck, which I find to be extremely flattering, and the asymmetrical hem gives the look a bit of a modern twist. 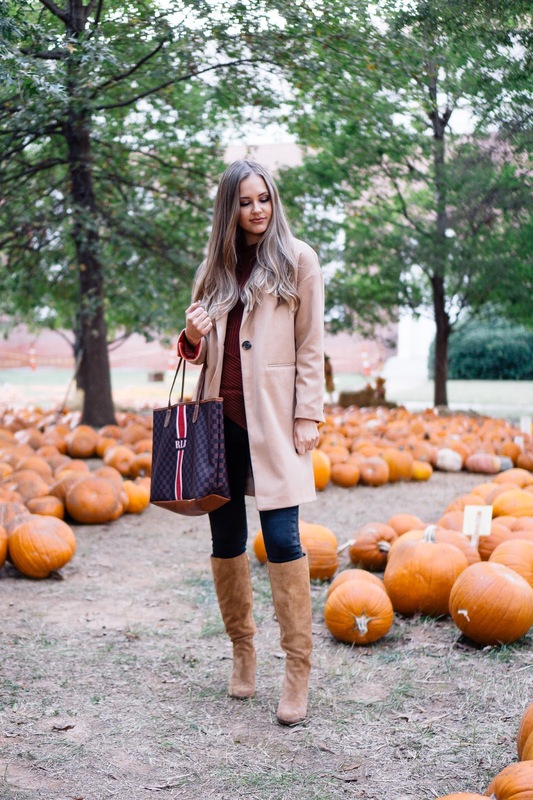 I styled the look with an affordable camel coat, which I think is one item every girl needs in her wardrobe. There is something about a camel coat that is so chic and timeless and I do not see them going out of style anytime soon. To finish off my look, I wore these boots from Sam Edelman, which have without a doubt been my favorite pair of boots this season. Even though they are heeled, they are so comfortable and the camel suede is just gorgeous to say the least. I hope you all have had a blessed Monday and continue to have an amazing week! The tote is so cute and you can truly use it for anything! I love the monogram on the front. Also, I am so obsessed with your boots. They are sold out of my size and I am so sad that I didn't get them sooner! Okayyyy first off, I NEED this bag. Secondly, THIS OUTFIT! YAAAAASSS HONAY!!! Why you always so cute?! I just checked the bag and oh my the bee design! I might need it someday.